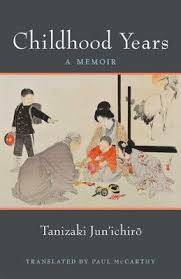 Childhood Years: A Memoir (translated by Paul McCarthy, digital review copy courtesy of University of Michigan Press) is another of the recent rereleases of Tanizaki’s work, having originally been translated in the early nineties. The work was serialised between 1955 and 1956, at which point the writer was approaching the age of seventy, but the book (as the title suggests) focuses on the other end of his life, covering the period from his birth to the end of his middle school education (the equivalent of high school in the West today). The first sections explain the origins of the Tanizaki family, whom the writer declares to be true Edokko (Tokyo folk), small business owners with a small printing press and several shops for selling rice. Jun’ichirō’s grandfather was the architect of the Tanizaki success, and it was expected that the family would follow in his footsteps, so it’s perhaps fortunate for literature that the following generations had less of a head for business. A theme running throughout the book is the gradual decline in fortunes of the family businesses, with the early wealth gradually disappearing, leaving the writer’s family to experience a rather less comfortable life. However, Childhood Years never dwells too long on this slide into poverty, instead providing fascinating insights into little Jun’ichirō’s life in turn-of-the-century Tokyo. There are occasional glimpses of major historical events, with fleeting mentions of the Sino-Japanese War and memories of some frightening earthquakes, but Tanizaki mainly focuses on his personal life. In the first chapters, he rummages through memories of his first homes, the rooms at the back of the businesses and the first real houses his family moved to. In the process, he manages to dredge up vague recollections of oil lamps, old tatami mats, visits from fishmongers and the time spent with his nurse, Granny Miyo. This was the only form of entertainment for children in the days before there were cinemas or even street storytellers with their illustrated tales. Of course one could not see the dances every day; one had to wait for a fair or festival at some shrine to come around. But near my house were the Meitoku Inari Shrine in the same block, the Junko Inari in Kamejima-chō, the Ichō Hachiman in Kakigara-chō, and the Suitengū in Ningyō-chō, each of which held performances once a month. He goes on to recall amateur performances of plays held just for the neighbourhood, vividly evoking the shows he saw six decades back, and it’s clear that his fascination for the traditional tales that form the basis for the plays had an influence on his fictional works. There are other gradual glimpses of Tanizaki’s development as a writer throughout the book. His first steps are influenced by his high school teacher, a poetry lover who constantly wrote poems out on the blackboard for his students to learn. Young Jun’ichirō learns to save money for his trips to the bookshop, and his later private lessons in classical Chinese help to develop his literary style. His schooldays were useful in other ways, too, with several events providing ideas for his later fiction, one example being the story ‘The Little Kingdom’ (included in the New Directions release a cat, a man & two women), which is based on a charismatic boy in his primary school class, and (as the writer explains) is very close to what really happened during his school days. Yes, Childhood Years has the usual interest in affairs of the heart (and the loins), with several mentions of geishas and lewd men hanging around on street corners waiting for good-looking little boys. It’s little wonder that the writer grew up to explore this interest in sexual relations in his fiction. Interesting review. Tanizaki’s description of his family sounds quite a lot like the premise of the Makioka Sisters though based around Tokyo rather than the Osaka of the book. I enjoy Tanizaki. He’s a versatile writer, not as well known as he should be. I do love Tanizaki, and you have inspired me to get out my copy of my The Maids. Childhood Years sounds fascinating, and so I must read the ones I have first. Kat – I’m still making my way through my collection – with more on the way!